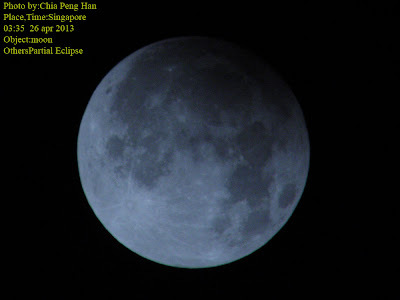 There is a *PARTIAL* Lunar Eclipse visible in Singapore tomorrow early morning before sunrise. Visually, it is NOT exciting or spectacular at all. So do not stay up whole night/morning expecting the whole Moon to turn reddish brown (as in a Total Lunar Eclipse)! Quote from eclipse webpage from NASA: "This event is barely partial with just 0.5 arc-minutes of the Moon's northern limb dipping into the umbral (darker) shadow". How small is 0.5 arc-minutes? Extend your arm, extend your pinky finger, look at the width of that finger tip. Divide that distance about 60 times! And then half that 1/60th unit! Only that small part of the Moon will be transiting through the darker shadow of Earth. 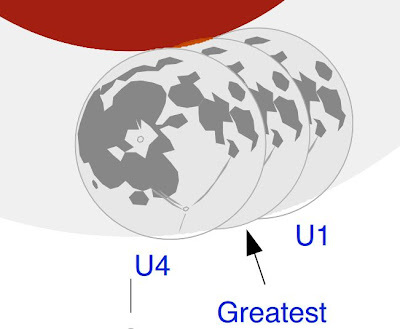 Earth's darker shadow (umbra) is represented by the dark brown area in the following diagram. The lighter shadow (penumbra) is represented by the grey area. Photographically, it may interesting to shoot the Moon before/after and during the partial eclipse at the same settings and see if you can see the difference from the images taken. If the sky is clear enough, the penumbral phase should be visible for those with keen eyesight. But haze and passing clouds may make observing the difference more challenging. Perhaps more interesting is the star-like object near the Moon tonight - Saturn! Look at through telescope or big binoculars to see its rings and moons! Saturn is only about 3 days to its closest approach to Earth this year! Check out this partial lunar eclipse photo by Mr Chia shot in Singapore! Very impressive considering the sky condition then was not really clear and haze free. It rained at around 4 am+. 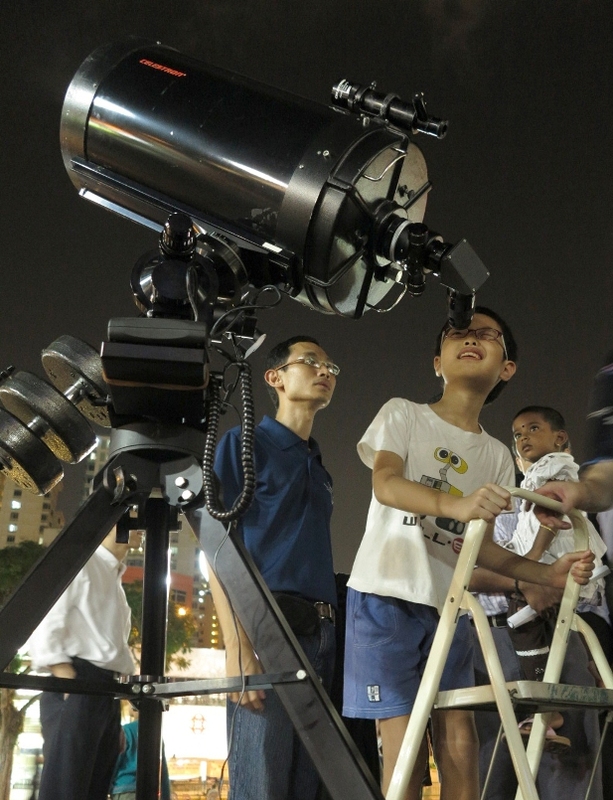 There is a free public stargazing talk at SAFRA Jurong this coming Saturday. Admission is FREE. No pre-registration required. Suitable for the whole family including school-going children. Late-comers are welcomed too. Click on poster to enlarge it. The topic for the talk is "Stargazing for Beginners". It will be conducted in SAFRA Jurong's Evergreen Room. I will be sharing some useful stargazing skills, knowledge and resources to let the aspiring stargazer start off on the right foot. Free paper star maps will be given and I will explain how to use it during the talk. *Weather permitting*, there will be a live stargazing session at SAFRA Jurong's Multi Purpose Court (besides the basketball court). 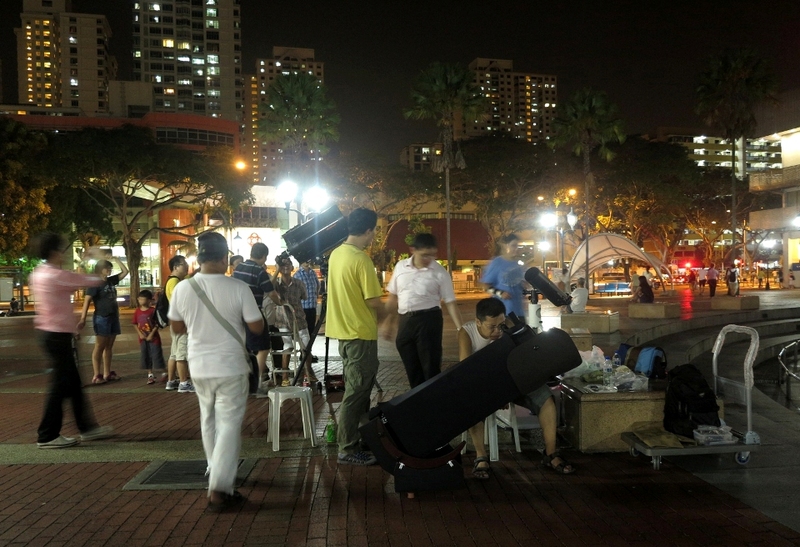 Telescopes will be set up to let the public look through and even take photos of the Moon with their mobile phones. You may want to bring your digital cameras along for better quality lunar shots and videography. The telescope volunteers there will be glad to answer your queries about stargazing and their astronomical equipment. If you have a new or old telescope or binocular that you cannot figure out how to use it, why not bring it along that night and let us show you how! - Saturn with its rings and moons! Saturn is getting very close to Earth. - First quarter Moon revealing plenty of craters and surface features like mountain ranges! - Bright Star Clusters and prominent constellations. Some of them are even colourful! By MRT: Alight at Boon Lay MRT Station and walk South towards the T-junction formed by Boon Lay Way and Jurong West Street 64. You should see Jurong Central Park to your left along the way. By Bus: Alight at Boon Lay Bus Interchange and walk South towards the T-junction formed by Boon Lay Way and Jurong West Street 64. You should see Jurong Central Park to your left along the way. Bus services at Boon Lay Bus Interchange: 30, 79, 154, 157, 172, 174, 174e, 178, 179, 180, 181, 182, 182M, 187, 192. By Car: Drive along Boon Lay Way, turn left into the SAFRA main entrance and then into the underground car park. Parking fees per session from 6pm onwards: $1.66 (SAFRA members), $3.45 (non members). 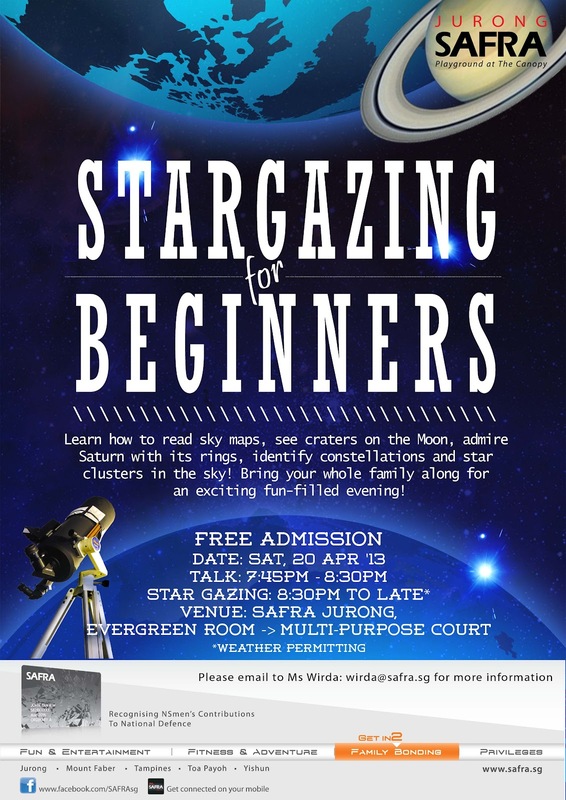 Kudos to SAFRA Jurong for the invitation and after weeks of planning, my friends and I are really excited to travel west and spread our love of astronomy and stargazing to the general public! Hope to see you there soon! Let's all pray for clear skies on Saturday evening! Update ( 3/5/2013): Big thanks to all who came for the event! 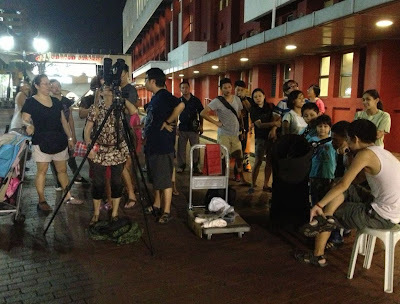 Especially to SAFRA Jurong and telescope volunteers and helpers. Watch this slideshow of some of the photos taken during the event. Enjoy! *Weather permitting*, we will be conducting live stargazing session outside the library from about 7:45pm. 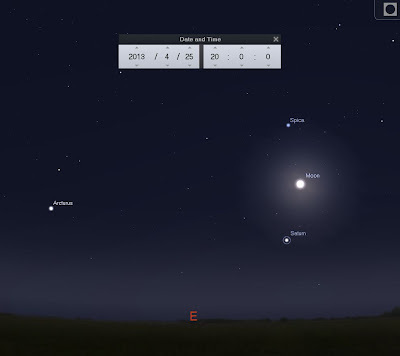 Near 1st-quarter Moon, Jupiter and Saturn will be visible! All are welcomed with or without telescopes! Bring your family and friends along and enjoy an entertaining and educational evening at Toa Payoh Public Library tonight! I used to laugh at people being so attached to their phones that they use them in the bathroom while seated on the throne. But thanks to whatsapp and twitter, I have recently developed this habit too. Just can't wait to read the latest stargazing messages sent by my friends when I wake up in the day. The one that caught my attention this morning is a whatsapp message attached with a beautifully composed landscape astrophotograph in today's Sunday Times captioned "Starry, Starry Night". You had me at the first starry! Straits Times travel writer Miss Lee Siew Hua wrote a 2-page article titled "Star Struck" on the Life! section on page 12 and 13. It is a report of her recent stargazing experience in New Zealand. After running some errands and spending time with my family, bought 2 copies of Sunday Times in appreciation of the stargazing and light-pollution awareness it will create locally. Totally enjoyed reading the article. Found myself nodding my head frequently and thinking "so true!" and I want to say few words about this, and this, and this, and this too! (1) The journalist of course have no intention to deliberately mislead anyone with her very sincere report. (2) My following comments are meant to clarify some POTENTIAL misunderstanding by readers which MAY arise, especially to total newcomers and especially local readers who may wonder "how about in Singapore?" while reading it. "ST" and yellow text represents quotes from the report. [ST] I turn novice stargazer last month (March 2013), spending two early autumn nights in Lake Tekapo and another two in Mount Cook. [ST] As a child of five ...sprawled on the grass.... I saw the stars..."
I am making an assumption here which may be very wrong - she did not have any or much stargazing experience through telescopes in Singapore (just saying, nothing wrong with that) and her first four attempts to look through a telescope is at these two amazingly dark clear sky locations in New Zealand - good and lucky for her! Considering my above-mentioned assumption, this may be misinterpreted as Saturn rings can only be seen in such pristine clear sky and far away locations. Fact is, we can see Saturn and other planets, Moon and Sun (safely through certified solar filters) right here in Singapore through telescopes when the sky is clear enough. If you have a good view of Sun's path across the sky from your house, you may even observe planets like Saturn through a telescope within the comfort of your room. As for stars from horizon to horizon, we definitely can't see it that now in Singapore though on a very clear night, we can still see many stars from about 10 degrees above the horizon. But of course, still no where close as the total number of stars visible in such locations in New Zealand. [ST] Today, so many flags are embellished with stars. Think of America's stars and stripes, China's big and little yellow stars, New Zealand's Southern Cross, Brazil's starry sky, Singapore's crescent moon flanked by five stars. To further elaborate on this point, star designs on flags of New Zealand and Brazil (and a few more countries) are astronomically related. For China's and Singapore's, the stars are symbolic. [ST] An astrophotography "mini-studio" can be set up at home for less than US$5,000 (S$6,200), including the cost of a decent US$2,500 telescope. "Compare that to the price of a speedboat," he (Mr Fraser Gunn) reasons. Astrophotography is perhaps the most demanding and serious aspect of amateur astronomy, compared to just casual visual astronomy. This is perhaps the very same reason it is so rewarding to astrophotographers - the satisfaction of seeing and sharing the beautiful fruits of their labour of love. There are different types of astronomical objects that can be photographed. To produce really quality images, one has to obtain quality hardware in addition to acquiring the necessary skills of various forms of astrophotography. So no doubt a "mini-studio" can be set up at home for less than US$5000, do not expect such a studio to produce images that has a higher quality than those studios that is setup with a much higher budget (assuming other things being similar - e.g. same quality of sky, processing skills of the astrophotographer, ...etc). Though "decent" and "US$2,500 telescope" are mentioned in the context of a "mini-studio" and "astrophotography" which usually refers to the refractor telescope design, I am a little concern readers may forget/misread the context and conclude that all decent telescopes of all designs for all astronomical purposes must be at least US$2,500. And thus may give up taking up the hobby as this figure may be still beyond their budget. This is of course a wrong conclusion base on misinterpretation of this paragraph. Brand new decent complete telescope set for the aspiring beginner mainly for visual enjoyment can be purchased for about S$400+. In the used market, one may even get better value there. 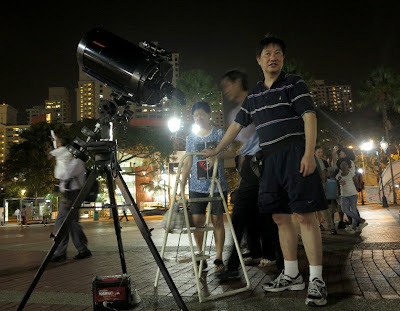 And of course, one can also enjoy stargazing with decent pair of binocular at a lower than S$400 cost. Also, I find Mr Gunn using the price of speedboat to make a point about the affordability of an astrophotography "mini-studio" not very convincing. No doubt the cheapest speedboat may be relatively cheap, but to the common person in the street, the idea of a speedboat conjures up monetary figures of at least 6 digits (if not more) and filthy rich rap stars throwing parties on-board (thanks MTV). So a speedboat makes a lot of other hobbies affordable too! Perhaps a better comparison may be with a typical home photography studio where just premium camera lens alone may cost a few thousands dollars each easily. That concludes my quote-and-comment section. - Kudos to the photographer Miss Hannah Teoh for the photos. I assume (might be wrong here again) she is relatively new to astrophotography. If that is true, then the published Orion's "Sword" astrophoto is a very commendable effort. It is most probably much better than I can ever shoot for the rest of my life. Readers who wish to look at the current standard of astrophotographs taken by veteran local astrophotographers can do so by visiting the SINGASTRO astrophotography subforum. Some of them are even shot right here in Singapore. - They are many beautiful phrases in the article. Shall not reveal all to spoil your enjoyment of the article if you have not read it yet. One of my two favourite phrase is " ... and I forget there is a universe out there." Simple words but powerful and thought-provoking statement. Me nods head like crazy when I read that. What a costly mistake that has been for me and I am so glad I realised that a few years ago and took the necessary corrective actions before my eyes are too old to enjoy stargazing. This regret is also one of my main source of motivation to do free public stargazing sessions and talks - jogging back this very important memory in others of the wonders of the universe that is happening right above our heads. - Extremely happy about the inclusion of a light-pollution segment "Saving the starlight". Thanks to this article, get to know about Miss Margaret Austin. She is 80 and still "fighting". A nice figure to inspire us who think we are too old to do anything about light pollution in Singapore. I hope the Singapore Tourism Board will also be inspired by this article to explore astro-tourism in Singapore. I can already hear the naysayers screaming BUT BUT BUT....! (1) Find out what light pollution is and what it is not. And the how simple the solutions can be. (2) Think about this - if we are bold enough to dream and formulate official plans to go to space and venture into the satellite industry, why should reducing light pollution in Singapore sounds so impossible? Reducing light pollution is not rocket science! - For those who have a really tight budget or financially not very well to do (myself included), the prices mentioned in the report and the implied total cost of such a stargazing trip may still feel relatively too high to them. Of course, one cannot expect the best of both worlds - premium stargazing experience at a few dollars. But my only slight concern is some of such local readers may go the other extreme end - totally give up hope of seeing Milky Way skies or taking up such a hobby due to their tight budget. So the good news is that local amateur astronomers have been going to rural Johor in West Malaysia for Milky Way stargazing trips more than a decade! 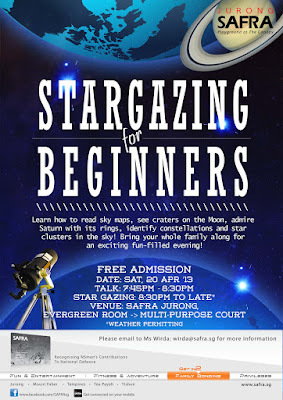 In fact, this coming weekend, a bunch of local astronomers are going up Johor again for their monthly stargazing fix. The total cost of such trips is definitely lower than a trip to New Zealand but I like to stress that this is a COMPROMISE between an affordable trip for the budget very conscious stargazers to see milky way starry nights. So do not expect stunning Lord of The Rings visuals in rural Johor. Some of us can afford long distance trip for stargazing in countries like New Zealand but cannot afford the time due to work or family commitments. So stargazing in rural Johor during the weekend is also a great way for us continue to enjoy this hobby despite our busy schedules. In conclusion, this Straits Times report is about stargazing in New Zealand and no doubt it should be focused on this topic and thus has done an excellent job as a travel article listing the interesting stargazing spots to visit in that beautiful country, when to visit them, prices of accommodation, ...etc. 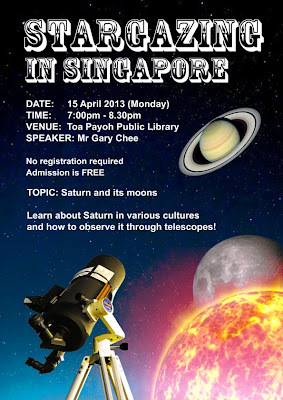 But from my bias perspective as a promoter of stargazing to the local public and considering the article has so successfully stirred the astronomer in all of us, I wished it could have at least include a line somewhere to the effect of "it is still possible to enjoy stargazing in Singapore" and "find out more from your nearest astronomy club and society." And now I shall watch more stunning time-lapse videos by Mr Gunn and hope to save up enough money someday to stargaze at this beautiful place!